Guess what time it is? Secret Recipe Club! This month I was assigned Debbi's blog Debbi Does Dinner Healthy. Debbi is also the very gracious hostess Secret Recipe Club's Group C and keeps us all organized and on schedule each month. I was excited to browse Debbi's blog because she has so many great dinner ideas....that are healthy! Debbi mostly focuses on meals that are under 500 calories (though she throws in desserts here and there where calorie counting is strictly off limits!). I had every intention of making something savory from Debbi's blog. I had my eye on Raspberry Glazed Rosemary Chicken, Parmesan Chicken Bake and Chicken Poblano Casserole. All so tasty looking! The muffins are fluffy and soft on the inside and have a slight crunch on top (which I love) if you serve them fresh out of the oven! With a lightly sweet crumb, a pop of fresh blueberries and a bit of heartiness from the wheat flour, it's a great way to start your day. Thanks Debbi! Preheat over to 350 and line 12 cup muffin tin with liners. In a medium bowl whisk flours, baking powder and salt. Toss the blueberries in the dry mixture. In a separate medium bowl whisk egg until light in color. Whisk in sugar and then add melted butter in 2 additions until combined. Whisk in the sour cream in 2 additions until combined. Add the sour cream mixture to the flour mixture and gently fold until just combined. The batter will be very thick (almost the consistency of cookie dough) and may have some streaks of flour. Do not over mix. Divide the batter into the muffin tins (I like to use a full size ice cream scoop for consistent portions). Bake for 25 - 30 minutes, rotating the pan halfway through baking, until muffins are lightly golden brown and a toothpick inserted comes out clean. Remove muffins from the tin and cool on a wire rack for 5 - 10 minutes. Serve warm if possible. YUM YUM! I have had a recipe for BB muffins to make for about a month now. The blueberries ended up in the freezer...maybe today or tomorrow as I get OBG underway. These are one of my top muffins. These blueberry muffins look just beautiful!! I love muffins, and yours came out beautifully. The top of the muffin (AKA the best part) looks perfect soft and crunchy. I am feasting on blueberries by the pint lately...these look delicious! those muffins look truly amazing! Gorgeous photos. Love the color of those yummy blues! Anything that puts blueberries into cake is good by me! 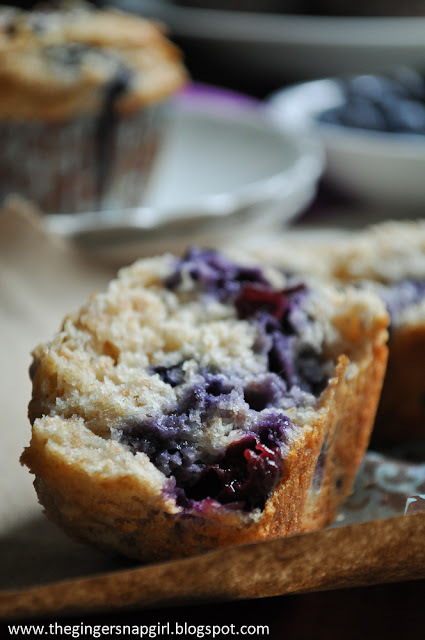 Blueberry muffins are one of my favorite food groups! These look delicious. 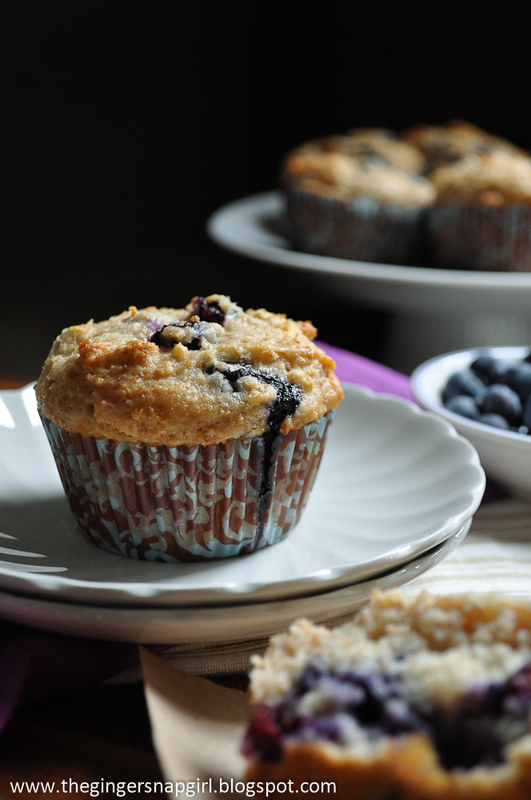 YOu cannot go wrong with blueberry muffins! YUM!